Curtis, Edward Sheriff (born White Water, WI, 1868–Los Angeles CA, 21 Oct 1952) Edward S. Curtis's legacy was a monumental, heroic and theatrical record of the American Indian and their recollected and imagined way of life before the white man. From 1900 to 1914, his mastery of the grandest pictorial style and technique in his photogravures and silver and platinum prints was rivaled only by the most elegant prints of Edward Steichen and Alfred Stieglitz. Between 1898 and 1928 he made over 40,000 negatives of more than 80 Indian tribes west of the Mississippi and in Alaska. Working in collaboration with many tribal members Curtis created an ethno-historical account combined with photographic notions of character portraiture, environmental portraiture and classical romanticism. He traveled among the tribes in the summer seasons gathering photographic images, written interviews and sound recordings. In the winter he made prints, delivered lectures and sold subscriptions to his masterwork. There are 2200 images printed as hand pulled photogravures in THE NORTH AMERICAN INDIAN (1906-1928), considered the most lavish and elegantly illustrated set of photographic books ever produced. Curtis raised and spent millions to create it. Additionally, Curtis’s studios made fine art silver, platinum and orotone prints which he sold in Los Angeles and Seattle and while traveling to promote his project. 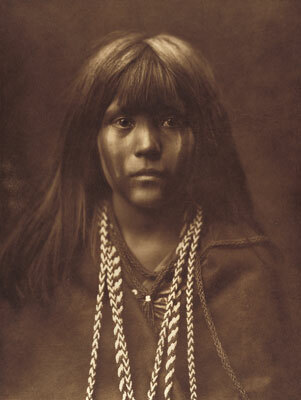 In the early 1890s he opened a studio in Seattle and began photographing local Indians. He was also an active mountain climber particularly on Mt. Rainier where his legacy started when he rescued two prominent scientists C. Hart Merriam and George Bird Grinnell lost while climbing Mt. Rainier. This fortuitous rescue led to Curtis receiving patronage from some of the richest and most powerful businessmen in America. In 1899 he embarked as an official photographers on E. H. Harriman's two-month, 9,000-mile steamship exploration of Alaskan waters. His photographs from this series were published in a two-volume souvenir album of silver prints for expedition members and in two of 14 volumes of the trade edition as photogravures. By 1900 he had articulated and began pursuing his life's goal: to document, through photograph and written word, Indian traditions, habits, and life-styles west of the Mississippi River before contact with the white man completely destroyed them. Curtis undertook a series of exhibitions and articles to draw attention to his efforts, and he soon had the encouragement of Theodore Roosevelt and the financial support of J. Pierpont Morgan. From 1906 to 1914, Curtis’ promoted his photography and Indian project through his lectures, slide shows, movies, picture musicales, newspaper and magazine articles and photographs and was the most popular photographer in the United States, much as Ansel Adams was in the later 20th century. However the onset of World War I diverted the attention of people away from the Native American. Curtis was committed to his subscribers to finish The North American Indian, and doggedly continued until his magnum opus was completed in 1930. The post World War I work is more documentary and less romantic than the earlier pictorial work. WORK: Chiefly North American Indians. Also includes Harriman Alaskan expedition prints, stills from Curtis’ and Cecil B. DeMille movies. Negatives and prints: Platinum prints, cyanotypes, blue toned silver prints, gelatin silver prints, collodion silver prints, lantern slides, orotones (4 x 5” to 18 x22”, also called Curt-tones and goldtones, and photogravures. Photogravures were made in an approximate edition of 300 out of a proposed 500. He made an estimated 2000 orotone and photographic prints of The Vanishing Race, and editions in the many hundreds of a dozen or more images. The North American Indian appeared as 20 bound volumes incorporating 1503 small full-page photogravures (image size app. 6 x 8”), and 20 accompanying portfolios comprising 723 large photogravures (image size app. 11 x 14) printed on 18 x 22 sheets of various papers: tissue, Japan vellum, Holland (Van Gelder). A small number of ephemeral printing and promotional materials, and printer and artist photogravure proof prints, often on alternate papers, also exist. BUYER BEWARE:After the completion of The North American Indian in the 1930s the project went into bankruptcy and the photogravure plates and unsold stock were purchased by Lauriat’s Bookshop of Boston. Lauriat’s began manufacturing posthumous photogravures from the original plates to fill in a dozen incomplete sets in the late 1960s, and since that time there have been numerous posthumous editions of photogravures (from the original plates), platinum prints, silver prints and orotones which are easily mistaken for original edition prints.